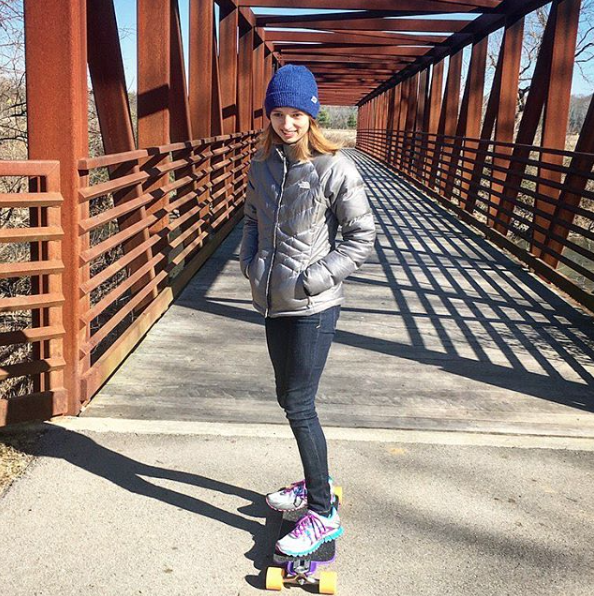 Anna shares this picture and why she loves longboarding. My dad introduced longboarding to me about 3 and a half years ago. I fell in love with it as soon as I tried it. I thought it was so much fun and I liked the constant challenge it provided for me. At first it was hard for me to ride, but once I could, I wanted to learn to ride faster and faster. Once I was faster I wanted to learn tricks. 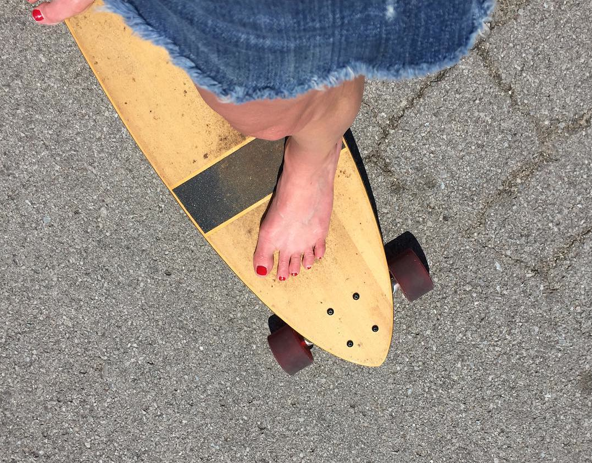 I still want to learn more on a longboard and I will always have more to learn. I like this because then I will never get tired of it. I love that I get to be outside while I ride. I enjoy being outdoors and going to different parks and places to ride my board. It is a great way to sight see in new places and get exercise. I have gotten a lot of my friends to join me in longboarding which makes it even more fun. I ended up getting a large group of girls together that all skated in the evenings. We would all meet at parks and go for long rides together. It was really cool for all of us to be able to do something together that felt different and adventurous. Most people don’t think girls would go out and longboard so it was fun to show everyone that we could. 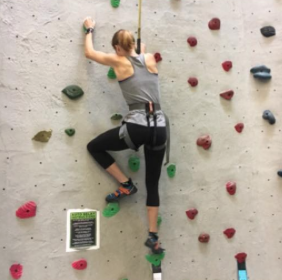 I think it is important for girls to get out and have fun and do something different. Girls don’t always have to do girly things. They can longboard or do whatever else they want to do. I have gone off to college now so I don’t have that same group that I did during high school. But every time I come back home we longboard together. It is something we all have in common that really brings all of us together. I miss boarding with them, but I still ride around by myself here at college. I hope to find some more girls I can skate with where I am now or to be able to introduce more to longboarding. Thank you Anna! I love how she shares her love of longboarding by getting more girls to try it and that no matter where she goes it’s something she has fun doing. Will longboarding or any type of skating be easy at first? Probably not but enjoy the process – it’s an adventure that never has to end. 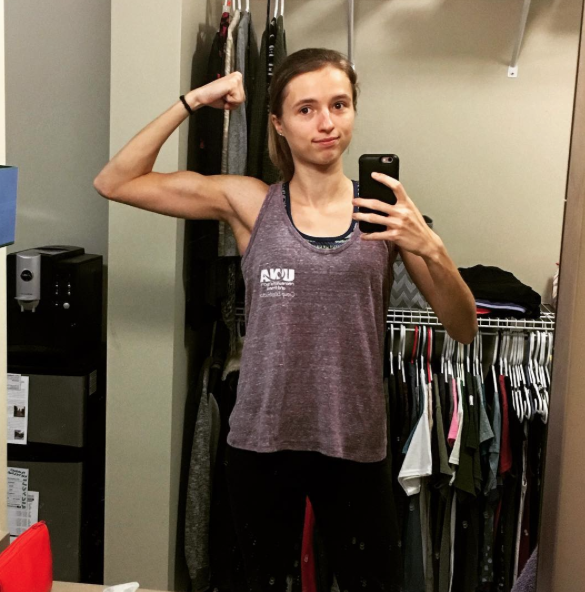 By the way Anna doesn’t just share longboarding tips she teaches a weight lifting class at her college. And sometimes she takes her adventures off the ground. Happy International Women’s Day! Hope you celebrate today & everyday by cheering on all people to chase their passions & pick adventure. 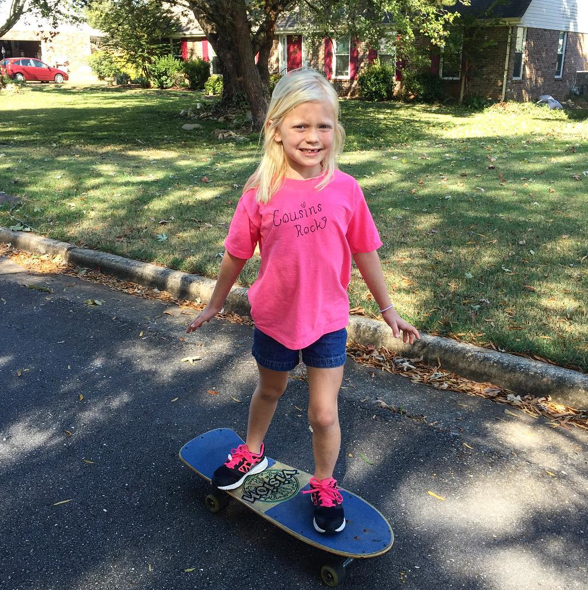 And she’s not alone in Alabama aegprice aka Amy skates instead of therapy. In Huntsville Alabama! 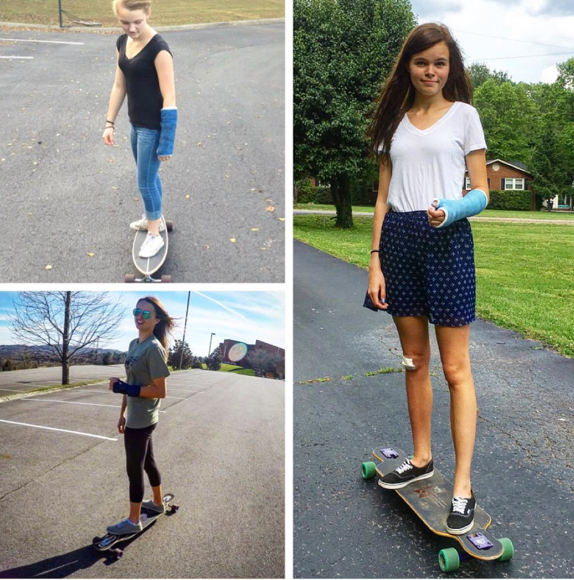 Sending healing wishes to the Greenway_surfers – who helped me find both these skater girls! Currently three of the members have broken wrists. Falling happens in skateboarding/longboarding that’s why skating teaches you falling isn’t failure!